Korey and Jesse are super friendly, professional and knowledgeable. Excellent customer service. I purchased a pool table from Craigslist and they met me at the location for pick up - as soon as they arrived, they put me at ease because I could immediately tell they had my best interest in mind and were making extra sure the table I purchased was quality. They installed it in my home efficiently and put beautiful new felt on. Hands down would recommend! My has been tasked me with a last minute project of finding someone to reassemble our pool table and felt it. In true husband fashion he gives me the job to do and expect it done day of or the next day at the latest. Frantic I start calling around and getting quotes and availability. 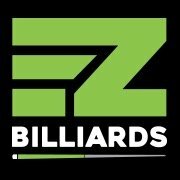 Although we did not use EZ Billards services I will say that they responded fast and they quoted a reasonable and fair price. I spoke over the phone with Rick, who was extremely friendly and answered all of my questions. We ended up choosing a Nother company to handle our job but it was only due to the availability and honestly, that's my husband's fault for giving me 48 hours to figure this out. I'd recommend Rick to anyone else just based on his timely response and friendly manner. Rick and his crew are amazing at what they do! Their professionalism, experience and knowledge about pool tables is top notch. I highly recommend them if you are considering doing anything to your pool table. I called them on a Sunday and had my pool table re felted by Friday of the same week.